Dealer Rick Hendrick recovering in N.C. after airplane accident in Fla.
Rick Hendrick suffered four broken ribs and a broken collar bone in a private plane crash Monday. No serious injuries were reported. There were no serious injuries on Monday night when a Gulfstream G150 jet carrying NASCAR team owner Rick Hendrick and his wife, Linda, ran off the runway at Key West, Fla., International Airport. 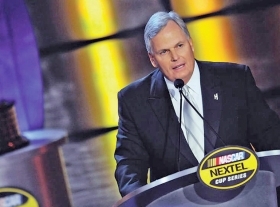 Rick Hendrick suffered four broken ribs, a broken collar bone, and bruising. His wife, Linda, suffered minor cuts and bruises in the crash. The Hendricks and the two pilots were released Tuesday morning from Lower Keys Medical Center and have returned to North Carolina. According to a statement released today by Hendrick Motorsports, Hendrick was admitted Tuesday to a medical facility in the Charlotte, N.C., area, "where doctors believe the pain can most effectively be managed." "(Hendrick) is in good spirits and is expected to be released by the end of the week," the statement said. Hendrick, 62, is owner of Hendrick Motorsports in Charlotte, N.C., and also is chairman of Hendrick Automotive Group, the seventh-largest dealership group in the United States with 2010 new-vehicle sales of 59,403. "Linda and I have been overwhelmed by all the words of encouragement and genuine concern we've received," Hendrick said in a statement. "We are blessed to have such a wonderful support system, and our family is extremely grateful for the thoughts and prayers. We extend our sincere thanks to everyone." The Monroe County Sheriff's Office said the crew radioed that the plane had no brakes when it touched down in Key West. It ran off the runway and went 100 feet past the airport's 600-foot safety area before stopping with its nose in a shallow salt pond. The National Transportation Safety Board will investigate the cause of the crash. The jet -- tail number N 480 JJ and owned by Hendrick Motorsports and Jimmie Johnson Racing -- remains in Key West pending repairs. CONCORD, N.C. (Nov. 2, 2011) – Monday evening, a Gulfstream G150 aircraft operated by Hendrick Motorsports ran off the runway after experiencing braking issues upon landing at Key West International Airport in Key West, Fla.
All four people on board -- Hendrick Motorsports owner Rick Hendrick, his wife, Linda Hendrick, and two Hendrick Motorsports pilots -- were released from Lower Keys Medical Center early Tuesday morning. Mrs. Hendrick was treated for minor cuts and bruises, and both pilots were released without injury. Upon returning home to Charlotte, N.C., on Tuesday, Mr. Hendrick was further evaluated as a precautionary measure by his personal physician. He was diagnosed with four broken ribs (previously stated as one broken rib), a broken clavicle (as previously stated) and bruising. No other injuries have been identified. Due to discomfort from the injuries, Mr. Hendrick was admitted Tuesday afternoon to a medical facility in the Charlotte area, where doctors believe the pain can most effectively be managed. He is in good spirits and is expected to be released by the end of the week. "Linda and I have been overwhelmed by all the words of encouragement and genuine concern we've received. We are blessed to have such a wonderful support system, and our family is extremely grateful for the thoughts and prayers. We extend our sincere thanks to everyone. "I'm so proud of how our pilots handled the situation, and we're extremely appreciative of the folks in Key West who went above and beyond to help us. It's good to be back in Charlotte as we regroup and focus on our family."